At this point I assume all of our international travellers are back in London, and ready to get down to the business at hand. That business is getting ready to play Leicester on Monday, then go to Lisbon next week, then return to London to play Crystal Palace on Sunday and then … well, let’s take it three games at a time, shall we? As it’s still quiet we get to play that old reliable game: what can we learn from the training pictures? 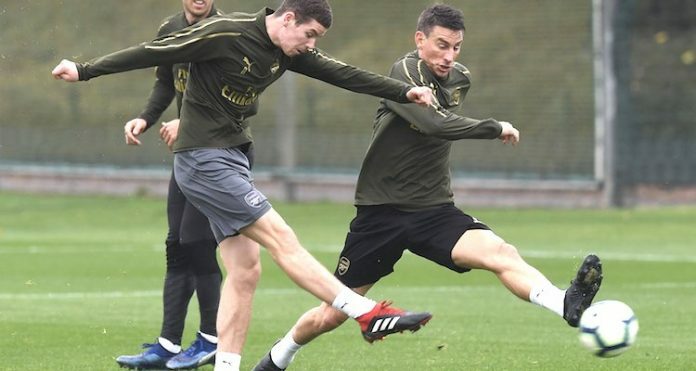 The first thing of note is that Laurent Koscielny now appears to be back in full training, integrated with the group and playing some football rather than rehabbing on his own. I know he’s 33, I realise he’s suffered a dreadful injury the effects of which we’re yet to fully realise, but this is good news. During the week, the official website ran a story about ‘The detail behind our defensive plans’ in which Shkodran Mustafi went into some depth about all the things a defender should do but which he often finds hard to. In fairness to the German, he played well against Fulham, but he’s set a low bar for himself this season with a string of individual errors and misreadings of the game which could well have proven more costly. Also, it’s fair to say that as a team we haven’t really produced defensive solidity on a consistent basis. You might say it’s hard to prove consistency in just ten or twelve games, but as good as our winning run has been, there’s always been a worry in my mind about how generous we’ve been at the back. Defending is a collective thing, the recent arrival of Lucas Torreira into the starting line-up has helped a bit too I think, but I’m glad to have Koscielny back in the squad to remind people there’s some competition and to keep people on their toes. We don’t know yet if the schedule set out for him has been updated. All along they’ve said the end of November is the target for his return to action, and this may well be just part of that progression and playing him earlier would be too risky, but maybe he’s ahead of where he was expected to be and that can only be a good thing. The captain putting pressure on people for his place in the team is a positive. Also back in the group is Ainsley Maitland-Niles whose opening day injury couldn’t have come at a worse time. With Unai Emery prepared to play a 19 year old straight out of Ligue 2, it might well have been a chance for him to get some playing time and earn the trust of the new head coach. Instead he’s spent the last two months recovering from a small fracture in his left fibula, and now our midfield appears to be taking shape with Torreira and Granit Xhaka as his first choice, with Matteo Guendouzi next in line. The good news for him is that Emery doesn’t seem to rate Mohamed Elneny that highly. The Egyptian has yet to play a single minute of Premier League football this season and has become someone very much pushed to the fringes by the Spaniard. It can happen, a manager just doesn’t take to a player. It’s not necessarily a situation which can’t be turned around, but if you were to ask me I suspect Elneny will be on the move in the not too distant future. With Carabao Cup and Europa League games coming up, the team selections will be interesting. Maitland-Niles’ versatility means he could fill in in various positions, but if Emery were to select him and Guendouzi in midfield, it would tell us something about how he’s viewed. I’d like to see it. Not because I don’t like Elneny, I think he’s a pretty solid if unspectacular player who works hard and keeps the ball moving well enough, but at a time when we’re thinking not just about now but the long-term prospects of the club, bringing through another graduate from the academy would be fantastic. We’ve got Alex Iwobi making strides again, there are high hopes for the likes of Emile Smith Rowe, Reiss Nelson and Eddie Nketiah, and having a core of young players who illustrate that progression from the youth levels to the senior team is a realistic prospect, then it’s healthy for the club. If Maitland-Niles can establish himself under Emery as a midfield option, then I’m all for it. He needs the games in there to be able to do it though, so we’ll keep an eye on things to see how much he’s involved in the weeks ahead. Another man spotted in those pictures from London Colney is Carl Jenkinson who, had it not been for a bad ankle sprain in August, would surely have been playing his football somewhere else at this point. According to transfermarkt.co.uk he has a contract until 2020, which is really quite something. It means he was given a five year deal back in 2015 before being loaned to West Ham, but since then his career trajectory has been steadily declining. He had a cruciate knee injury which sidelined him for almost a year, then a brief return to Arsenal first team action which didn’t go well and we used Gabriel as back-up to Hector Bellerin, before an ill-fated loan spell to Birmingham where serious injury set him back again. He’s an Arsenal fan, as we all know, but at this point he really needs to get himself back on track and that probably means playing elsewhere on a permanent basis. Remember, he earned himself an England cap back in the early days of his time with us, and while it’s not going to happen for him at the club he supports, that doesn’t mean he can’t establish himself elsewhere. So, that’s enough reading into the training pics for one morning. We should start to get a trickle of team news throughout the day, we’ll cover that on Arseblog News, and I’ll be back tomorrow with an Arsecast and all the rest.